You still have few months to visit the Albanian Pavilion at Venice Biennale: in “Albanian Trilogy: A Series of Devious Stratagems” the artist Armando Lulaj (Tirana, 1980) recalls the collective memory and the forms of power from Cold War until today, exploring the hidden wrinkles in the written and re-written pages of history. After his participation in 2007, Armando Lulaj represents again the Albanian Pavilion at Venice Biennale, showing three videos: It Wears as It Grows (2011), the already famous Never (2012) and Recapitulation (2015). Albanian Pavilion seems exactly to display the image evoked by Okwui Enwezor to describe All the World’s Future, theme of this 56° Biennale: the Angelus Novus of Walter Benjamin, staring the past is pushed to the future without any possibility to come back. We talk with the curator Marco Scotini, that in a long interview introduces ourselves in the Land of the Eagles, showing the ghosts of the history. Alessandra Ghinato: What are the Devious stratagems in the exhibition? Marco Scotini: The “devious stratagems” are the ways used of the communist power to justify its own role during the Cold War. Stratagem is a sly expedient made to surprise an enemy or to bypass an obstacle: it is not a strategy or a real political plan. 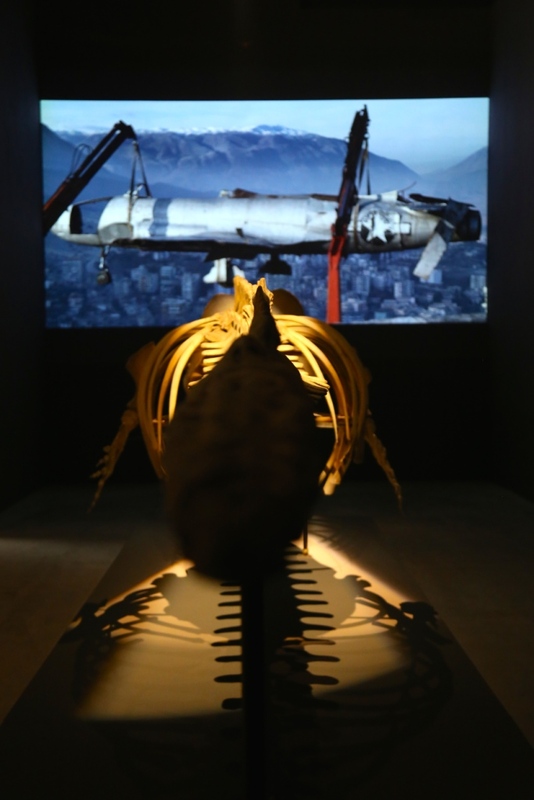 The series of “trophys” in the Albanian Trilogy is always referred to some moves to educate the public opinion: the name of the charismatic leader engraved on hillside, the whale confused with an enemy submarine and the remains of a pseudo American spy plane. This is the first interpretative level, then there are the stratagems used by Lulaj to develope his three projects. In the centre of Albanian Trilogy there are the tricks of the present we suffer every day in the era of communication and financial economy. This art of persuasion is mad, nonsense. A.G: When did you meet Lulaj’s work and what does it impress you more? M.S: I have been working with Lulaj for fifteen years and I invited him in many important international occasions. Lulaj always answered with his radical research of what is hidden behind the things, showing the ideological level. I don’t mean “say the thruth” (“thruth is always a cumbersome word) but “recognize the lie” of sentences, stories, comunicative plans. This is the “tragic” level, the everlasting challenge, the Lulaj’s key element. A.G: What is the story exhibited in the videos? M.S: The entire project was born five years ago with the first video “It Wears As It Grows”. 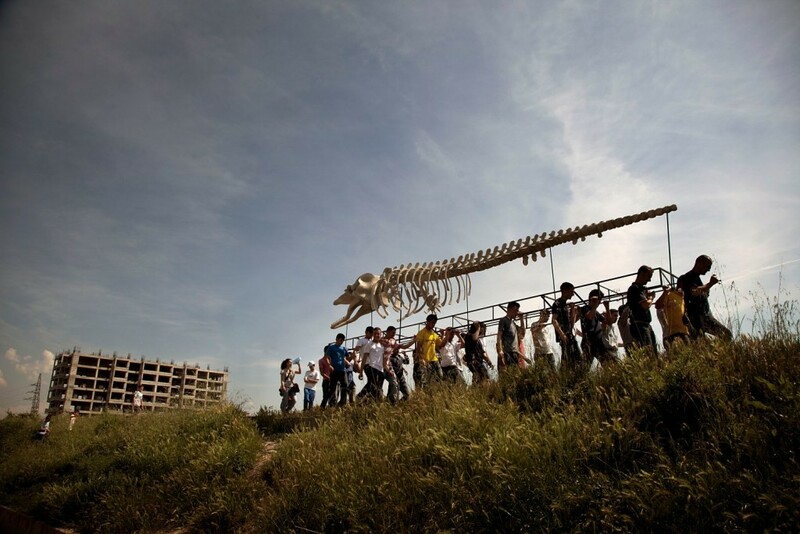 I went to Tirana to participate at the shooting, in which a reproduction of the whale carcass was carried on the the back as a coffin throughout the city of Tirana, from North to South, from East to West. 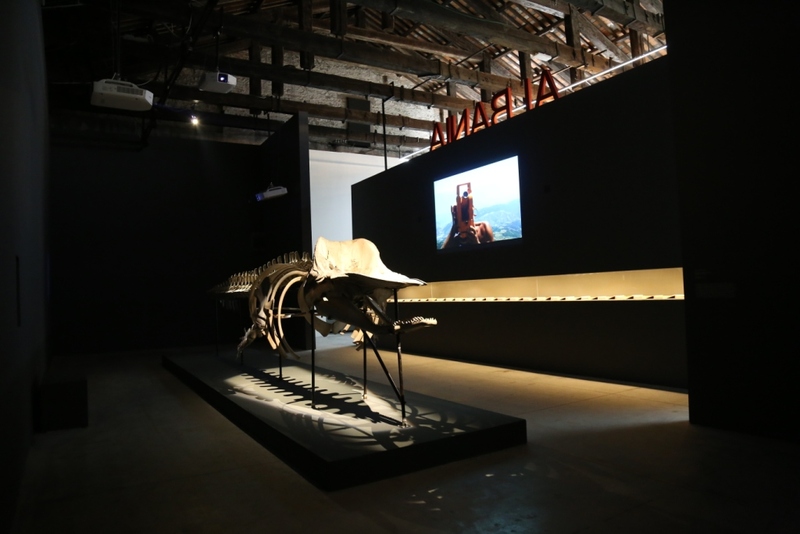 The whale was mistaken for an American submarine off the Albanian coast and in the performance the animal was re-politicized, replaced in its own urban context, from the Natural Sciences Museum to an hypothetical museum of social history. It is a performative video, the others interchange action and documentation, archive images and awareness of reality. They display two marginal historical events, emblematic for the whole period, for the modern culture. “Never” (2012) and “Recapitulation” conceived for the Biennale are two fundamental other chapters. A.G: How do other objects complete the tale? M.S: In the pavilion the relation between the whale skeleton, the series of seventy books signed by Enver Hoxha and the video “Never” is unique. It is a spatial and visual continuity that tells many stories at the same time. For example, the disposition of the books is parallel to the whale spinal column and the portraits of the leader in the frontispieces are replaced by the vertebras of the animal. This perceptive relation transforms the animal in the symbol of the Leviathan of Hobbes, emblem of the modern state power. The video over the volumes series repeates, one after the other, the leader’s signature, encrusted on the ridge of Shpiragu Mount, in the place of the page. This is one of the association that the space-time of the pavilion makes possible. There are other imperceptible associations discovered during the setting up of the exhibition. I am talking about an extraordinary coincidence that I am narrating here for the first time. 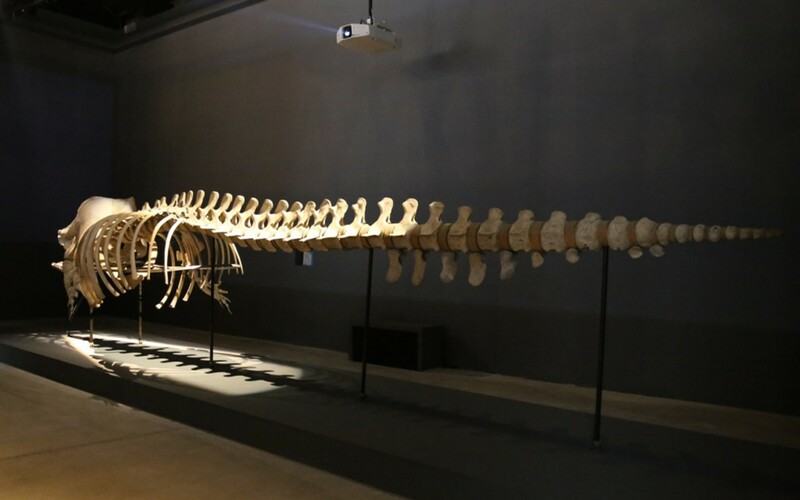 As official supervisor of the Natural Sciences Museum of Tirana Grigor Jorgo came to Venice, a man of ’51 who cares the assembly of the cetacean pieces. The experience was singular because this silent gentleman, walking around with the white coat, directly reminded us the socialism. But it is not enough. Jorgo told us that he started to care the cetacean only after the communist downfall and before he had worked in the commitee of Hoxha books’ editorial production. The relation to whale and leader continues to arise in different forms. A.G: How is heavy the historic memory in the Albanian youths? And in the spokespeople, such as the Albanian artists and also Lulaj? M.S: For Lulaj, more than for other artists of the previous generations, the memory or the history is a sort of obsession. There is a very serious reason of dealing with the past and, in Lulaj, has a particular character. More than the past, the ghosts of this past continuously reappear in the present: working on this theme means to operate on the current events trying to demystify the false perspectives. I believe that Albania is living a very interesting transformation moment and the weights of the past help the flight. A.G: The theme of the archive is very recurring in the last artistic explorations, what role has in your curatorial research? M.S: It is hard to sum up in few words this archive practice, appeared for the first time in the conceptual art, and now the hegemonic manner to make and curate art. I began to use the archive in the exhibition format from the beginning of 2000, when it wasn’t a trend. The most important thing is that it removes the linearity of the historical narration. We can’t make just immanent constructs of the presented object, this is the power of the archive and it should be also the resource of the curator. We must pay attention that, through a continue inappropriate use of this tool, it doesn’t become a weakness. A.G: Is the publication part of the exhibition? A.G: What is the reaction of international, Italian and Albanian visitors? M.S: I only say that “The Guardian” put Albanian pavilion in its Top 5 and “Corriere della Sera” at second position. We are waiting for the closing of the Biennale to evaluate the local acceptance of this national participation. A.G: With the gaze to the past, do you think that the construction of future is possible? M.S: Present is always full of past (latent, potential). If we want to free the future we can’t ignore the presence of the past. The attempt to force the past by Lulaj recalls Benjamin. It is always a possibility, something we meet in the ordinarity. The ways are the same even if the figures are changed, so the question is: How can we call the new Leviathan? 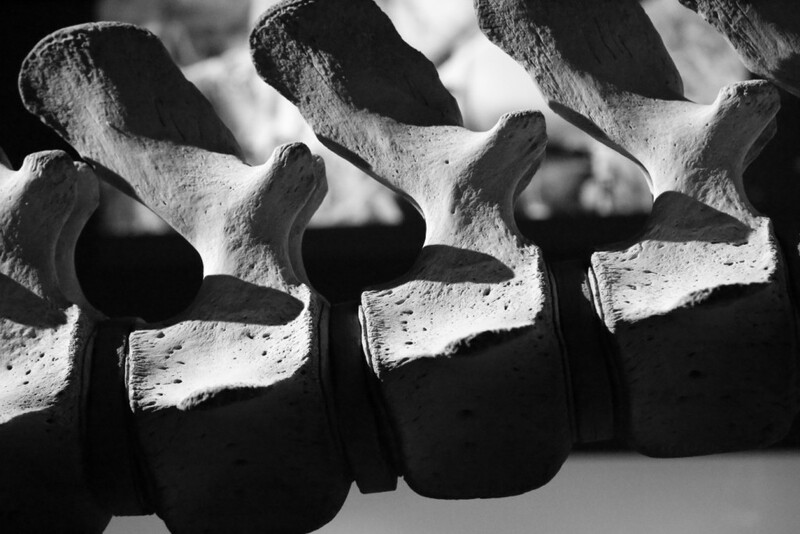 The Leviathan of the future? Obviously if we think that freedom isn’t something already given but it is something we have to practice, to imagine, to conquer.